1. A group of closely related organisms capable of interbreeding to produce fertile offspring are known as members of a ___. 3. The cytoplasm of the cell is considered a very important component because it __. 4. After an hour, the level of water in the thistle funnel will __. 5. 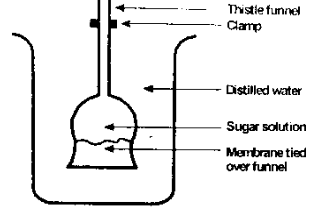 The experiment is used to demonstrate the process of __. 6. In a plant cells, the role of the membrane is played by the __. 7. Red blood cells were found to have burst open after being placed in distil for an hour. This phenomenon is known as __. 8. The curvature movement of plants in response to the stimulus of water is called __. 10. The longest bone in the body is the __. 11. Which of the following structures is not a skeletal material? 12. The reason why the flow of blood through the capillaries is very slow is ___. 13. 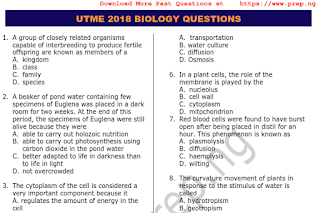 Which of the following groups of organisms has kidney as their excretory organ? 14. Which of the following features is not a characteristic of arteries? A. possess values at internals throughout their length. D. transport oxygenated blood with the exception of the pulmonary artery. 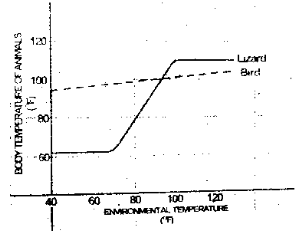 The graph below shows the results of a laboratory investigation which measured the body temperatures of a lizard and a bird under changing artificial conditions. 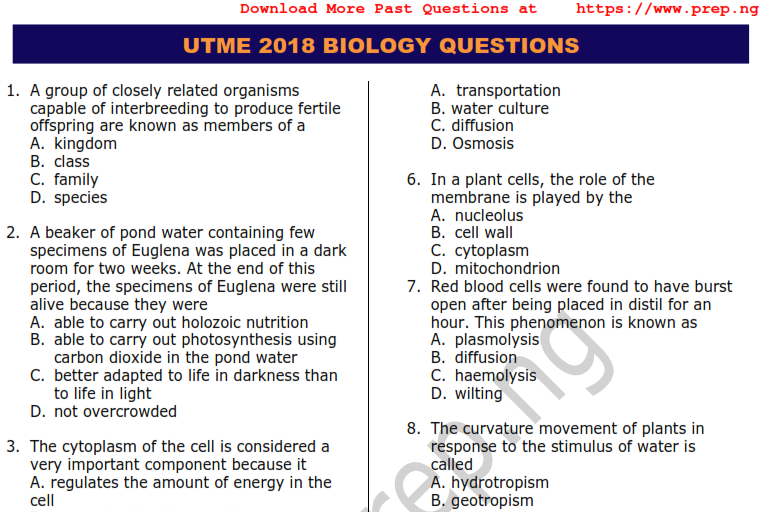 Use to answer questions 15 and 16. 15. Which of the statements below is valid? 16. 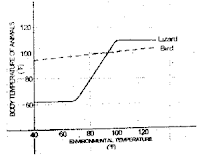 What physiological term can be used to describe the regulation of the body temperature of the lizard? 17. The reason why hospitals use saline solutions as drip instead of water is __. 18. The part of the ear which contains nerve cells sensitive to sound vibrations is the __. 19. Spectacles with convex lenses correct long-sightedness by __. 20. A seed of a flowering plant can best be described as __. 21. Which of the following processes removes carbon from the atmosphere? 22. Which of the following cycles involves the process of precipitation and transpiration? 23. What is the critical limiting factor for plants below the photic zone in an aquatic ecosystem? 24. Which of the following instruments is used to estimate the number of plants in a habitat? 25. Which of the following statements is true about sandy soil? It __. 26. Which of the following organisms is a primary consumer? 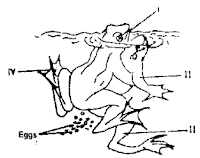 Study the diagram of a food chain shown below and use it to answer question 27 and 28. B. is a primary consumer. 29. Which of the following diseases is not hereditary? 30. The immediate product of meiosis in flowering plants is the __. 31. DNA in eukaryotic cells is contained in the __. 32. A man who is heterozygous for the disease haemophilia marries a woman who is double recessive for haemophilia. What percentage of their offspring would have the disease? 33. Cytokinesis of mitosis is a process that ensures that __. 34. An animal which is active during the day is known as a __. Use the diagram below to answer questions 36 and 37. 36. The diagram shows that the organisms are __. 37. The breeding posture illustrated in the diagram is known as __. 40. The flippers of a whale and the fins of a fish are examples of __.